The introduction of the first Kindle eReader in 2007 ushered in a new era for books. Since then, eReaders have grown in popularity—even outstripping sales of traditional physical books according to some sources. But the pendulum has swung back in favor of print in the last year, with many speculating the rising prices of digital books tipping sales back to physical books. 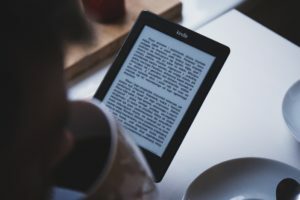 No matter what the sales, and despite the eReader market now entering its second decade, many people may still be wondering if they should buy an eReader. 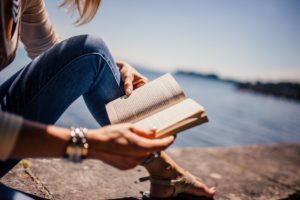 This article is to address those fence sitters by presenting the major pros and cons about using an electronic reader. I also want to point out that this article is about eReaders— NOT electronic tablets such as the iPad. Many people use tablets—as well as their phones—to read books. But this article is strictly about eReaders, such as Amazon’s Kindle. And finally, this article is really for people who read standard fiction and non-fiction. It’s not about picture books or text books. An eReader allows you to buy a book from anywhere you have an Internet connection. Need a book at 1:00 a.m. in the morning? Just buy it and download it to your eReader. Need bigger text? Adjust the font size. This is a great feature for people whose eyes aren’t as good as they used to be. eReaders are great for travel. You can bring—or get—books easily and all on one device. No jamming your purse or bag full of books to go on vacation. Just take your eReader and you’re set. As a person who has moved twice in the past five years, I can attest to joy of not have to pack and haul hundreds of books across the country. Most eReaders can store more than 1,000 books. While I still own many physical books, my eReader is my library, and not having to search through dozens of boxes looking for a specific book is a great time saver. There are many free or cheap eBooks available—specially classic material that is no longer subject to copyright. You can load up on things like Sherlock Holmes, Shakespeare, Homer and whomever else strikes your fancy all at a low price. Also, as with regular physical books, many libraries offer electronic versions of books that you can borrow. Some eReaders offer nice add-on tools, such as a dictionary, allowing you to quickly and easily look up a word that you don’t understand. This is strictly for those wondering about eReaders vs. a tablet, such as the iPad. Many people use their tablets to read electronic books, which is fine. But studies have shown that LCD screens, such as the ones used by tablets, cause more strain on the eyes. Plus, LCD screens can produce a lot of glare—making them difficult to read in certain situations. One nice thing about eBooks is that they often will port from one device to another. A user may primarily read his or her books on an eReader, but if necessary, they can access the book from another electronic device, such as a phone, tablet or computer by using an app. While reading a book on a smartphone isn’t an ideal situation, it helps a two-hour wait in a doctor’s office go much quicker. Let’s face it—there’s nothing like holding a book. Books even offer up a smell that many find special. Some people just can’t give up that feeling. There’s a lot of joy sharing a book. Everyone has a beloved book that they’ve loaned to friends and family members. Unfortunately, sharing an eBook is often limited as to how much you can share it. While most eReaders don’t need frequent charging, they still do need to get some juice every once in a while. With a book that is never a problem. eReaders aren’t cheap. Generally, they range from about $70 to $250—a price you will probably have to pay every 3-5 years when you get a new device. In the past, this cost was somewhat offset by lower eBook pricing, but changes in the past few years have closed the gap between eBooks and physical books. eBooks tend to be cheaper, but now you might save $2-5 dollars instead of $10 on a purchase. Also, you can resell your physical books. You can’t resell an eBook. Depending on the type of eReader you buy, you will likely have some limitations of where you can purchase books. You can’t go an buy a Kobo eReader and expect to be able to read all of your Amazon.com eBook purchases. You’ll never have a problem such as this when buying a print book. In the end, there’s really no right or wrong answer to the print vs digital book debate. We’ve presented some arguments for and against using an eReader. It really comes down to lifestyle for many. If you don’t read a lot of books, the expense of an eReader may not be worth it to you. Or if you have limited space in your home—or have to move or travel frequently—having an eReader might be a perfect solution. Also, know that you can own both digital and print books. It’s not as if you have to give up one or the other. Again, it’s all part of your lifestyle decision. So, if you are interested getting an eReader, here’s a list of some of the major electronic readers available on the market. While there are other companies that make eReaders, these are the ones with the biggest market share. Each company offers a full line devices. Prices generally start around $70 and go to about $250 (although there are a few high end devices that cost even more). Increased pricing brings more features and improved performance. This includes larger screen sizes, sharper resolution, a built-in light, Bluetooth connectivity, and a better computer processor for improved performance. There are even some eReaders that are waterproof (if you want to read in the bathtub). As noted above, be very aware that any device you purchase will not necessarily be compatible with all websites that sell electronic books. So if you buy an eBook from Barnes & Noble it won’t necessarily play on your Amazon Kindle. 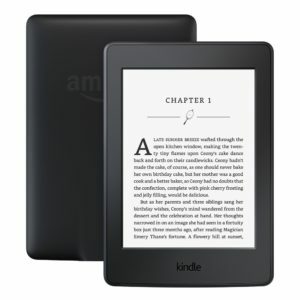 If you’re interested in comparing eReaders, just do a search online and you’ll find many reputable sites that offer comparisons.